The search for al Qaeda leader Osama bin Laden has focused on a remote area on the Pakistan-Afghanistan border. But after more than two years of battling remnants of al Qaeda and the Taliban, Pakistan ended its military operation in the border province of South Waziristan in November 2004 without finding bin Laden. Bin Laden evaded coalition forces during the U.S.-led war in Afghanistan in 2001, surfacing since then only in audiotaped and videotaped messages. 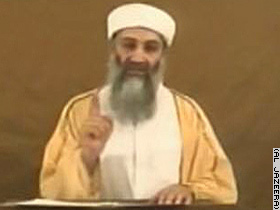  U.S. mulls $50 million bin Laden bounty | Who's in charge of hunt for bin Laden?  Officials: Bin Laden guiding plots against U.S.
 TIME: How close were Iraq, al Qaeda?